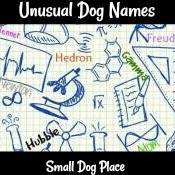 Dog Names are as diverse as the dog breeds themselves, and they seem to go in and out of popularity. There are so many possibilities that it can be a daunting task just coming up with the right name. Can't decide what to name your new small breed puppy? We've done a little research and came up with a list of some popular dog names by breed. 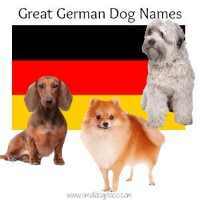 What is a Dog Names for Big Dogs doing on this site all about small breed dogs? 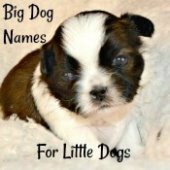 Some people like the idea of naming their tiny dog with a big name. Others have a big dog that they have acquired to guard and protect their small breed dog. 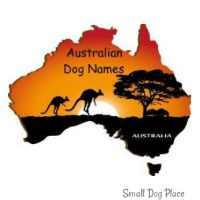 Find some amazing BIG dog names here. Even if you don't have a new puppy screaming for a name, it is just fun to read the names. Who knows, it might remind you of a favorite childhood cartoon. There are so many cartoon characters that this list could go on forever. We chose the ones that we think make the best dog (and other) pet names. 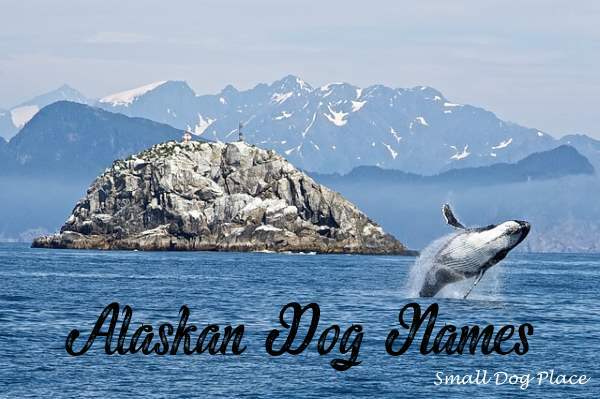 Exploring nautical pet names is not only fun, it can be educational. Names on this list are perfect for those who love the water, sun and surf, enjoy fishing or boating, or maybe you are a Cruise Line enthusiast. 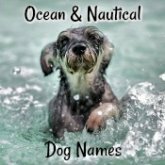 All the names on this page pertain to water, oceans, other bodies of water, fish and marine life, people who make a living on the sea, and of course, dog names with a distinctive nautical theme. 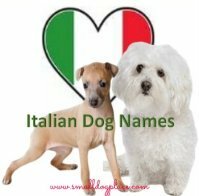 One and two syllable dog names are the best and easiest, however we have added a couple clever dog names that have 3 syllables. You be the judge. Is Your Dog a Star? Of course, all dogs should be a celebrity. Everyone thinks their dog is good enough to be in pictures. So how is that some dogs become stars that the world can admire (or hate) and others remain stars only to their admiring humans? Like most would-be actors, they happen to be in the right place at the right time. More important, they are trainable by special dog trainers. Country at heart? 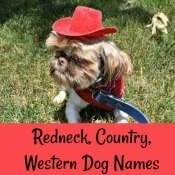 Call it Country / Western/ Southern/ Redneck or Hillbilly we’ve thrown together a list of great dog names. Love country music or maybe you fancy old fashioned names, this list is for you. This dog name list may be a bit out of the ordinary but there's a real sense of nostalgia. What's your favorite drink? Whether it is a coffee, tea, soda, or alcoholic beverage, we've got you covered on this page. 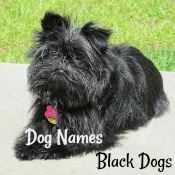 Some of the best names can be used alone or shortened to create a one-of-a-kind dog name. 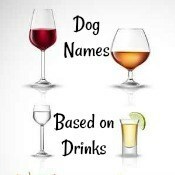 OR, you might be surprised to know that some of the most popular dog names can be traced to a type of drink. 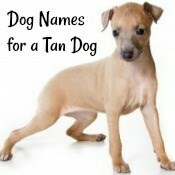 Why not choose an unusual dog name for that new puppy. These would work well with any dog, but especially those that are highly intelligent. Based on science, math, and astrology, there is bound to be a good name choice if you are looking for something a little bit different than Max or Bella. Have a tough dog, a tough dog wanna-be, or just a tiny breed of dog that deserves a BIG name. 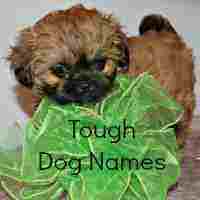 Check out our extensive list of tough dog names--they are great for giant breeds, large breed dogs and small breed dogs. After all,you don't need to be a tough guy to have a tough name. 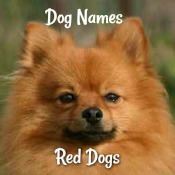 Some owners will pick a name that reminds them of the color of their dog. 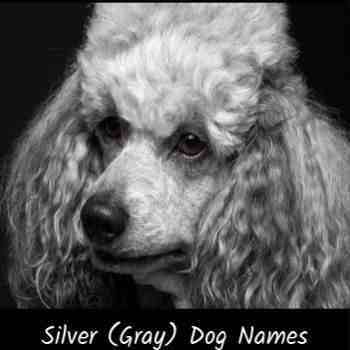 Does the color of your dog's hair inspire you towards colorful name? 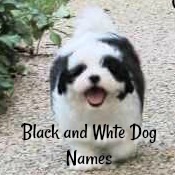 Click on the photo below to be taken to a great list of "colorful" dog names. Have a dog that loves the outdoors? Why not find the perfect name inspired by nature. We've put together a long list of ideas for anyone who has a trail blazing, tree hugging, fresh air enthusiast canine who'd rather be outside than anywhere else. 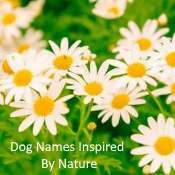 Inspiration for this list of names came from simple flora and fauna, the earth and sky and all things remotely connected to the great outdoors. 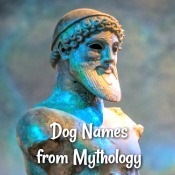 Think your new puppy might like a name based on an ancient superhero or mythical character? 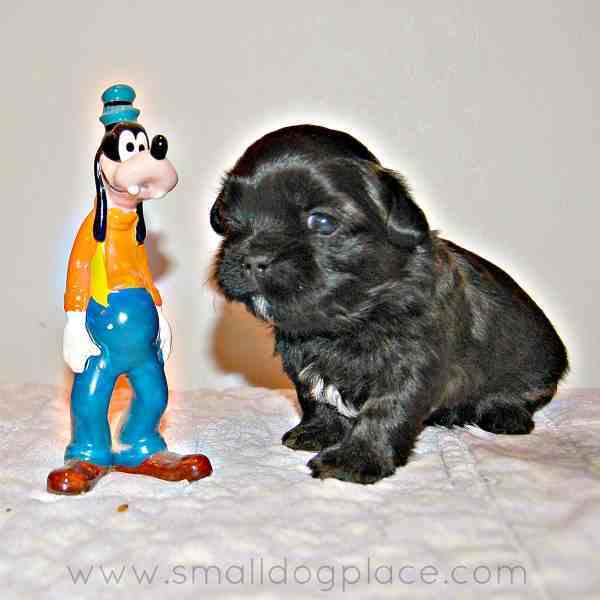 Is that new puppy the next Goliath, Flora or Odysseus? Maybe that tiny puppy reminds you of Greek or Roman god. Check out our list. 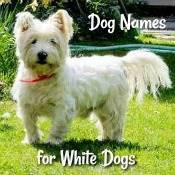 Popular pet names remain stable over several years, but there are always the exceptions. Pop culture, sports, even politics often dictate what we ultimately decide to name our new puppy. Are you Tech Savvy? Love to Surf? Just want something a little different. If names such as Applet, Beta, Boot or clone get you excited. 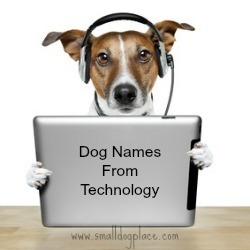 You should check out these dog names based on computer technology and the internet. You'll find a long list of choices and even a few definitions (just in case). 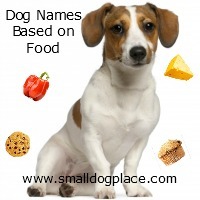 Some owners like to call their dogs by names that remind them of delicious foods. Maybe they were just hungry when they brought that new puppy home, but maybe there are deeper reasons why people choose a food name for their dog. Love Disney Movies, Cartoons, Books? Why not chose a name based on a favorite character? There are so many to choose from. Will you choose a vintage character such as Mickey or Goofy? Or, are the newer movies more to your liking. 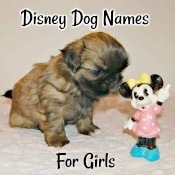 If you have a little girl, why not try one of the Disney Princess Names. Are you expecting a little furry bundle of joy this Christmas season? OR, maybe your new puppy was born on Christmas Day. 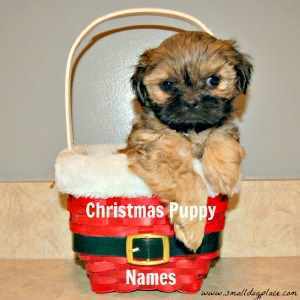 Either way, a very special name is important to honor the puppy born during this holiday season. Whether you choose to pick a religious name, a name based on an important Christmas character, or just a name reminiscent of the holiday, you have plenty of choices. 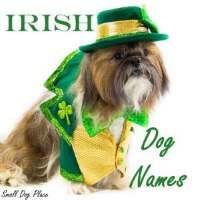 For all those puppies born on or around October 31st, this page is for you. 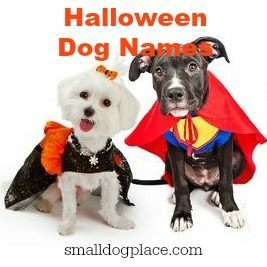 But even if you don't have a Halloween Puppy, you might want to browse through our extensive list of creepy, scary, and ghoulish names. Find one based on a famous villain or one that depicts the holiday for what it is, this is a fun page and not to be missed. 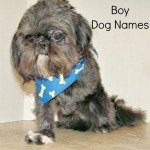 Since small breed puppy dogs seem more like children than pets, their owners will choose a name based on popular boy and girl names. 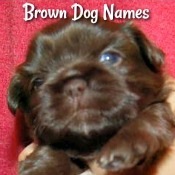 Names that are chosen by new parents-to-be are also used by dog owners-to-be. 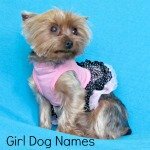 Look at any name list and you are likely to see dogs named Eva, Izzi, Sophia and Emily. If the fur baby is a boy, you might find names such as Noah, Jacob, Liam and Jackson. 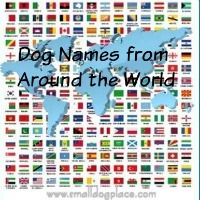 Dog Names by Country of Origin is a very popular way of choosing a puppy name, especially for a purebred dog. It is important to learn as much as you can about the breed before making that final decision, but it is also fun to discover interesting facts and learn about the breed's history as well. 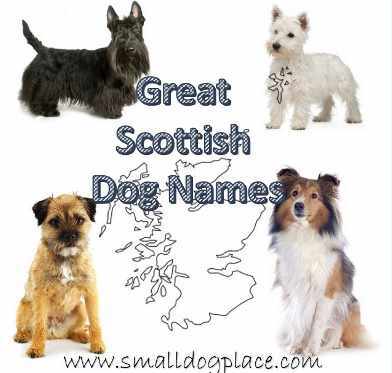 Some small breed puppy owners choose a name based on the country of origin of their pooch. Breeds that originated in Asia such as the Pug, Shih Tzu, Japanese Chin and Lhasa Apso might give their dog an Asian sounding name. How about Ming Sue, Mei Ling, Mei Lee, Haiku, Sushi, Sake, Sulu, Bonsai or Ying Yang? 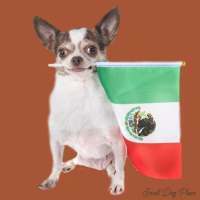 What is the country of origin of your small breed dog? 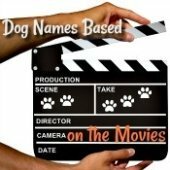 Who could imagine that there were so many famous dog names? 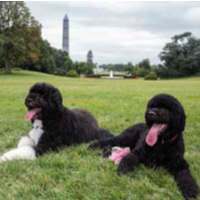 We found these names from a variety of sources including television and movies, children's books and literature, comics and cartoons, history, pop culture, and famous people's dogs such as the U.S. presidential dogs. There is a lot of overlap among these categories. For example, a children's book is made into a movie then altered to create a television series. When the name falls into more than one category, I only list it once. Concentrate on the first syllable of the name. This is the sound the dog will hear. But, don't limit yourself to a one syllable name -- two or three syllable names can be great. 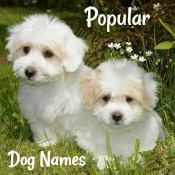 Choose a name that does not have the same first sound as another pet or person in the household. For example, it would be very confusing to two pets in the same household named Alexander and Alexandra. It would be OK to name two pets Abby and Alexander. Teach your dog his name by using it frequently. When training a dog to perform a new trick, it's always easy to say the dog's name first, then the command. "Zoey, Sit." Choose a name that stands the test of time. 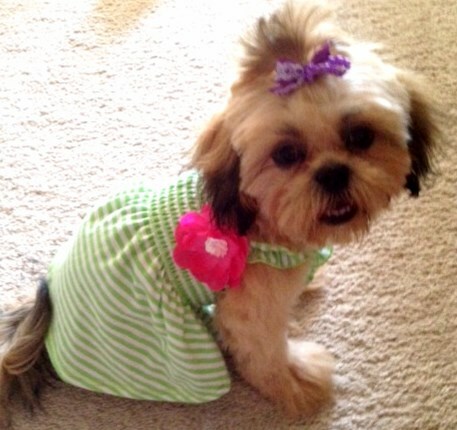 Trendy names are great, but remember most small dogs live 12 to 15 years. What sounds great today will be out-of-date in 15 years. 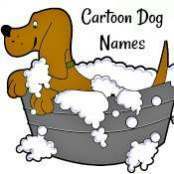 Choose a name that you feel comfortable shouting in public, at the vet clinic, groomers, or dog park. Don't pick a name that might cause embarrassment, could offend someone or worst of all, get you arrested!